Whether it’s a firmware update or security patch, an update to a config file on a device, or a factory reset, all products need maintenance after they are in your customers’ hands. And to manage your fleet, you need to know which devices in your fleet have received and processed, either successfully or unsuccessfully, any of your updates. 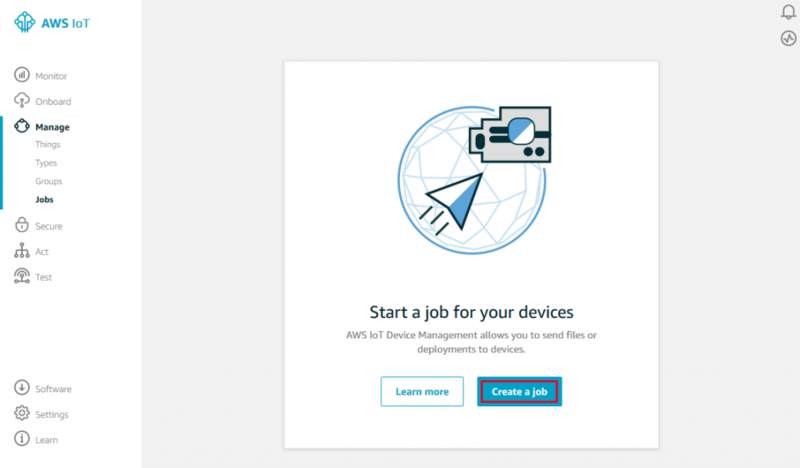 AWS IoT Device Management facilitates the deployment and tracking of management tasks to your fleet of devices with the Jobs service, whether you manage hundreds, thousands, or even millions of devices. Using Jobs, you can send remote actions to one or many devices at once, control the deployment of your jobs to your devices, and track the current and historical status of job executions for each device. To update firmware, software or other files such as security certificates on your devices. To perform administrative tasks, such as restarting devices or performing diagnostics. 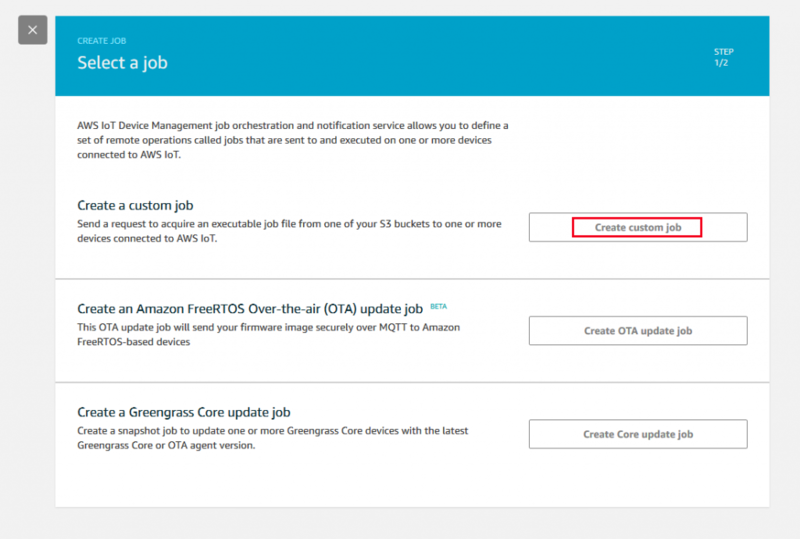 This blog post walks you through the creation and deployment of an example job to a device: setting up a device, configuring it to communicate with AWS IoT, creating a job, and tracking the job processing events. For an overview of the way AWS IoT Core works with AWS IoT Device Management, see the AWS IoT Core Features and the Jobs documentation. 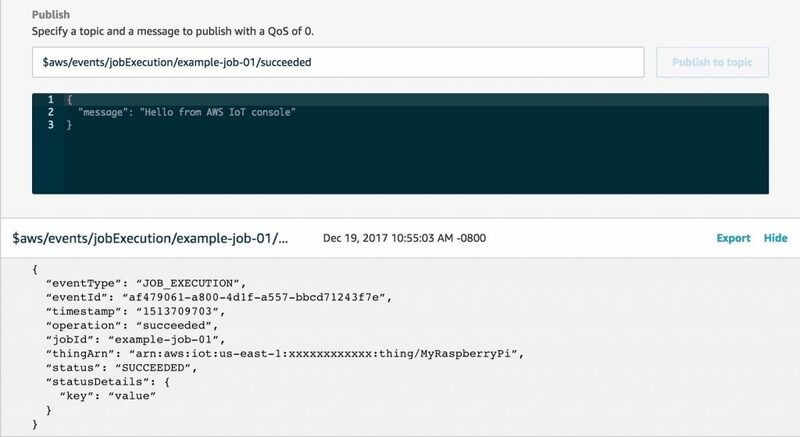 Follow the steps in the AWS IoT Raspberry Pi tutorial found here. Although the steps are written for the Raspberry Pi, you can use them for other Linux-based devices, too. After you complete the tutorial, you will have an IoT thing registered in your AWS account called “MyRaspberryPi.” You will also have configured security certificates to download onto your device. Your device is now configured to communicate with AWS IoT, including the Jobs service. Your device is now ready to process jobs and send and receive AWS IoT Core messages. It is now possible to create a job that delivers the job document to all of the devices you specify. You can use the AWS IoT console, the SDK, or the AWS CLI to create a job. If you’d like to store your job document on S3, you might use the `–document-source` parameter instead of the `–document` parameter to specify the S3 URL for the job document. 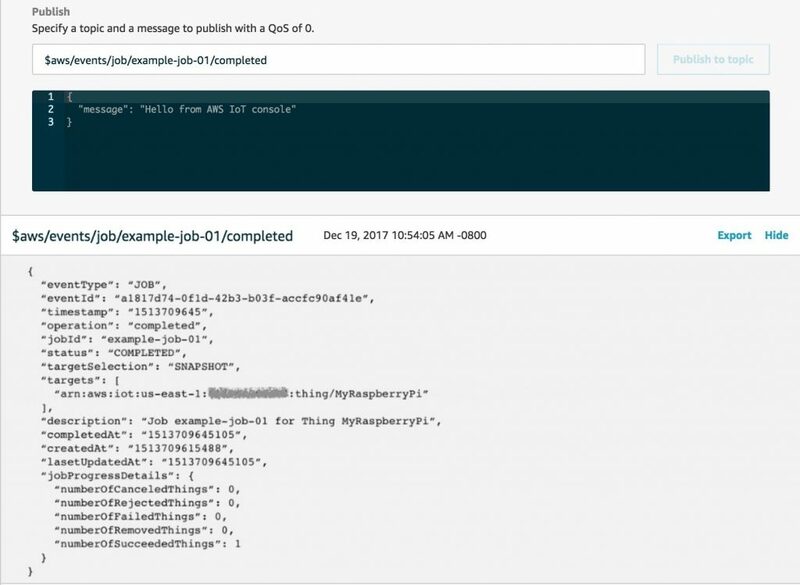 Upload the job document to an S3 bucket. For information about uploading documents to S3, see How Do I Upload Files and Folders to an S3 Bucket in the Amazon Simple Storage Service Console Guide. In the AWS IoT console, choose Manage and then choose Jobs. On the Select a job page, choose Create custom job. Choose Create and then you’ll see your newly created job. 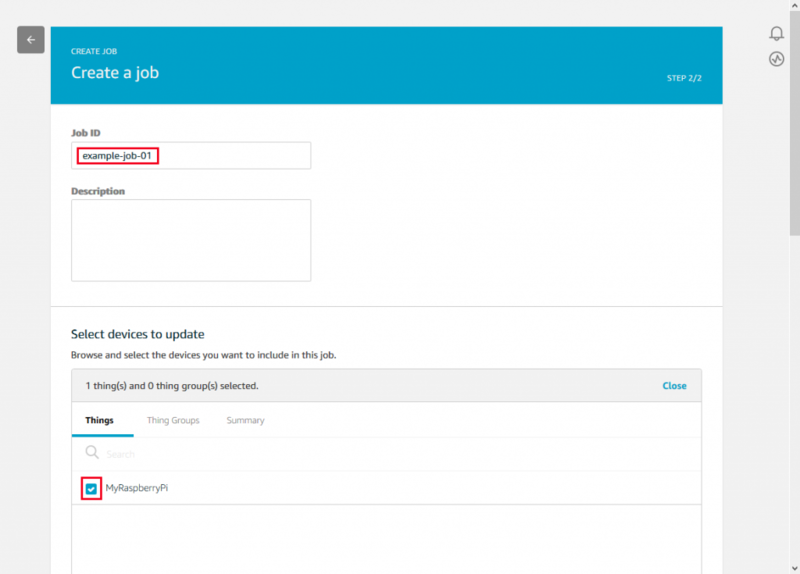 After your job is created, the Jobs service will send notification of a pending job to your device. 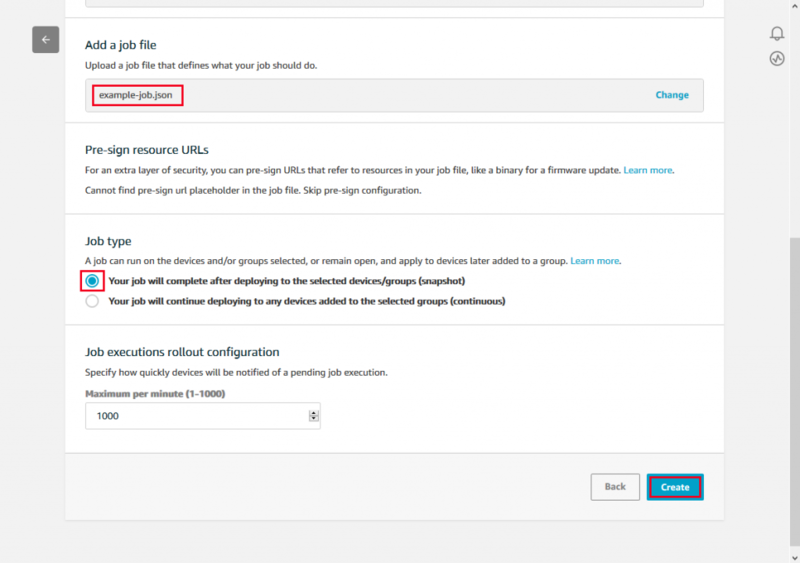 Your device will get the job details and document through the NextJobExecutionChanged API which it is subscribed to. The jobs-example.js program will execute the job on the device, and then publish its completed status using UpdateJobExecution API. During that process, you should see the following output on your IoT client. If you refresh the Jobs page, you should see that your job was completed successfully. You can also use job and jobExecution events to track the progress of your job. This can be helpful to alert users, system administrators, or other parts of your system that a job is complete or a job execution has changed its status. For example, you can alert a user about a firmware update on a device or inform a system administrator of an issue in their fleet that needs to be investigated and resolved. Job events are sent to the following topics when a job is completed or canceled. Job execution events are sent to the following topics when a job execution reaches a final status. Feel free to leave your feedback in the comments. If you have questions or issues implementing this solution, open a thread on the AWS IoT Device Management forum.